This Buttermilk Oven Fried Chicken Burger is LOADED with flavor, packed with veggies and smothered in spicy sriracha mayo – An awesome healthier burger that’s just crazy good and SO easy to make! Looking for a brand new burger recipe that screams comfort food but is actually healthy-ish? 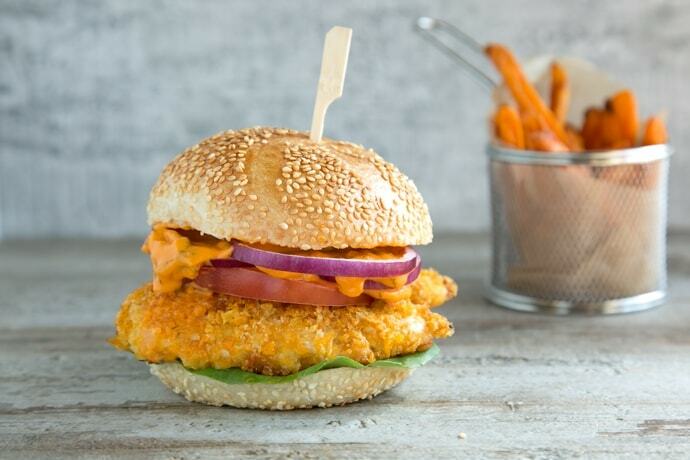 This Buttermilk Oven Fried Chicken Burger definitely fits the bill! 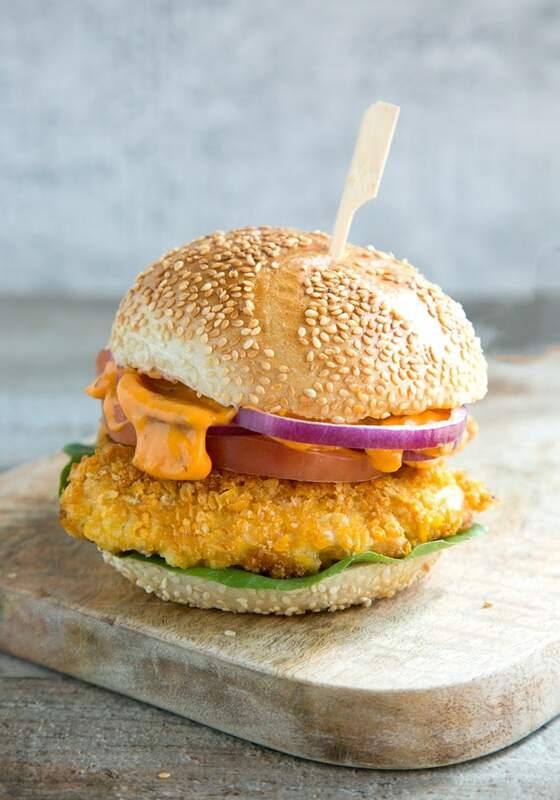 A crunchy bun filled up with super crispy chicken tenders, topped with a spicy sriracha mayonnaise, and packed with fresh veggies toppings – This burger is one of the most easy and tasty fakeaway meals to share with your family and friends. If you’ve been following along with me, you know that I’ve fallen head over heels in love with this incredibly crispy oven fried chicken, it’s just so easy to make and so much healthier! Plus, no flour or eggs required, only a buttermilk marinade and a simple coating made with easy ingredients. I like to make my own as it literally takes 5 minutes. All you have to do is mix the milk with lemon juice and allow to set for 15 minutes. Since I’m also dairy-intolerant, making my own buttermilk means I can also make sure it’s naturally free-from the A1 protein, so I always use easy-to-digest a2 Milk™. Since switching to a2 Milk™ my symptoms have reduced significantly. 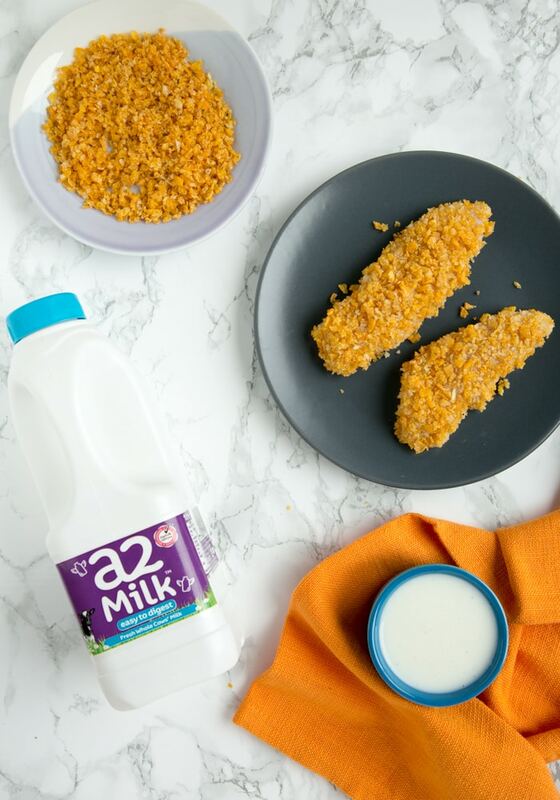 The award-winning a2 Milk™ is pure cows’ milk, which is naturally free from the A1 protein, so it’s a lot easier for me to digest and gentle on my sensitive tummy. Back to the crispy chicken tenders. The secret is a special coating mix that makes this baked chicken just as crisp as deep fried. It comes together in a few seconds, all you have to do is mix together cornflakes, panko breadcrumbs, a little bit of oil and a couple of optional seasonings. I get the tenderloins into the buttermilk marinade the night before (it takes 3 minutes really! ), and then coat & bake them whilst I prep the rest of the burger ingredients. It all comes together easily in 30 minutes max, start to finish. 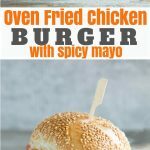 I also like to make a big batch of this oven fried chicken, so I can enjoy it on its own, then use the extra pieces for making this AWESOME chicken burger. Delicious homemade mayonnaise ( but you may use good-quality store-bought) with a fiery spicy kick, makes the perfect oven fried chicken burger companion. You can choose the amount of heat you want, I personally don’t like extra spicy things so I’ve kept mine on the low level, but you can definitely make it as spiced as you like. Simply mix garlic, mayonnaise, and sriracha sauce in a small bowl, add finely chopped pickles if you like, cover and chill until needed. 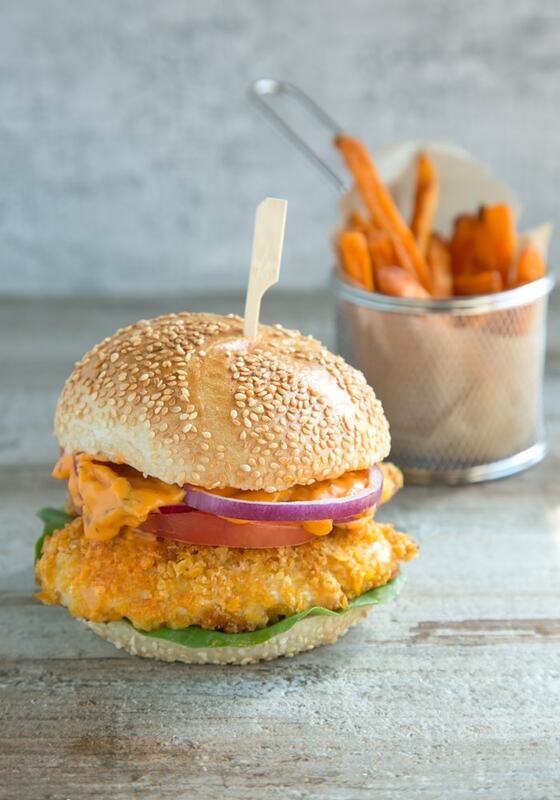 I’ve kept my Oven Fried Chicken Burger really simple using super common toppings such as lettuce, tomatoes and red onion, and served it with sweet potato fries. BUT, that doesn’t mean that you have to! Avocado, mushrooms, slaw, mustard, homemade ketchup, or any other of your favorite toppings and sides will surely work well, just customize your burger to suit your tastes and make it your own! This Buttermilk Oven Fried Chicken Burger is LOADED with flavor, piled with veggies and smothered in spicy sriracha mayo - An awesome healthier burger that's just crazy good and SO easy to make! * To make homemade buttermilk: In a large bowl place 125 ml of a2 Milk™and mix in 1 teaspoon of fresh lemon juice. Allow to sit for 5 min and use as needed. This is great recipe. I will try this at home. Thanks for sharing. Beautiful recipe! That burger looks like perfection, and spicy mayo is one of my favourite dips! Easy and delicious meal! Thank you so much! That spicy mayo is incredible I promise! This chicken sandwich looks wonderful, especially with that spicy sauce! Love that you do this in the oven instead of oil! What a delicious ecipe. Looks so crispy and flavorful too. Can’t wait to try this out. Pinned! Chicken sandwiches are such a great way to brighten up the burger blues. The crunchy coating and spicy mayo make this one dish I will be trying out soon. This looks SO perfectly crispy! Both my son and my husband have some dairy sensitivities – I wonder how they’d do with this milk? Looks like a fantastic recipe that the whole family would love! A2 milk worked well on my sensitive tummy, so it may be suitable for them, but make sure to check all info on a2 Milk website first. I love that this is baked in the oven versus fried. It makes me feel so much better about making it a part of our dinner plans. Love anything with a good spicy mayo too! I’m so excited to try this oven fried chicken. I can’t believe how crispy that outside layer looks without using a fryer. Can’t wait to try it! Looks like a great recipe! I bet that spicy mayo is wonderful! I’ve seen the commercials for the A2 milk, and was wondering how well it worked for people. I may give it a try. I love how simple this recipe is to prepare.I saw buttermilk fried chicken and clicked the link. I didn’t realize that these were OVEN fried. I’ve pinned this recipe so I can make it for my family. Where can I get the easy to digest a2milk from? The hubby and I no longer go to fast food joints and I think the thing we miss the most are fried chicken sandwiches. This seems like a healthier way to satisfy our cravings! What a great oven fried chicken dish! Love using cornflakes crumbs as a coating on chicken! So good! Wow that crust looks really crispy and just perfect. Oven baked chicken is so much healthier that’s why I love this recipe. I’m putting this recipe on my list to try. I know my family will love it. I can see why your oven fried chicken burger would be addicting! It looks so incredibly delicious and I love that it’s oven fried instead of deep fried! oven fried chicken. Ummm am salivating. My kids love burgers and this one will be an instant hit. Will try this soon. Everything about this is screaming my husband’s name! LOL we love a spicy mayo here and I’ve never incorporated pickles before! What a brilliant idea!! 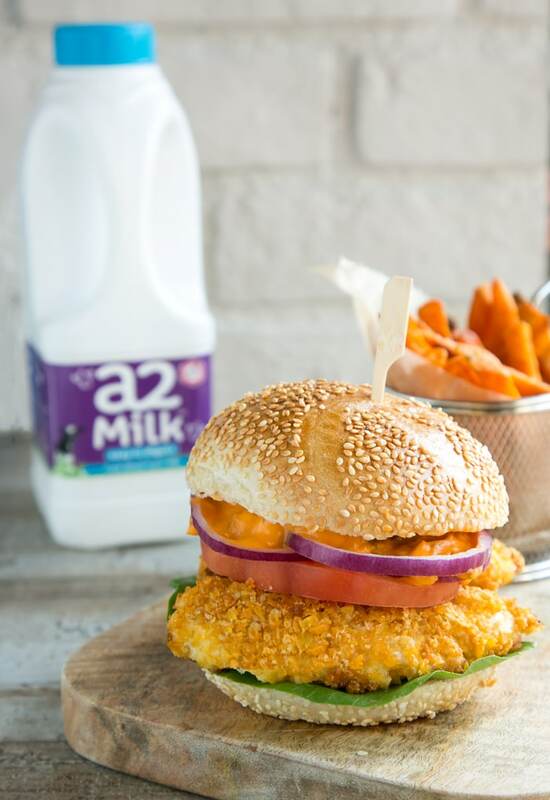 Love that it’s flour and egg free and these chicken burgers just look so darn amazing!!! I’m pretty sure I’ll need to put this spicy mayo on everything in sight! Thank you! I already put this mayo on pretty much anything edible!! Totally feel you, I hate frying stuff, oven-fried is SO much better! O God! What a great recipe! I want to try it immediately! Looks very tasty! yessss! This is the perfect recipe for me. Love the unique flavors in this recipe! Now, this recipe will be one of my favorites. Looks incredible! YUM!